The floor light / ceiling floodlight classic fitted with energy-efficient, high-performance LED technology. 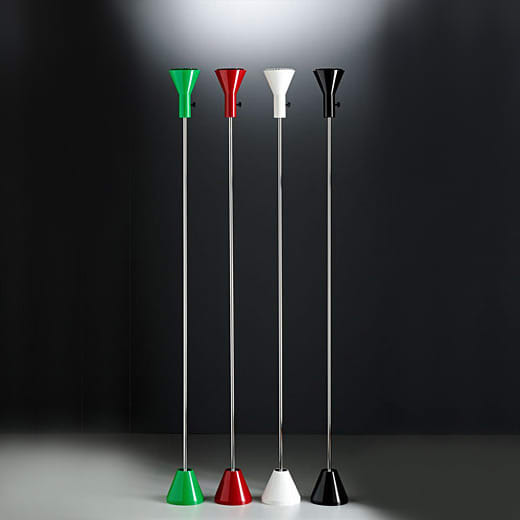 The stylish floor lamp ES 57 - can be used as a ceiling spotlights - was designed by Egon Eiermann, one of the most important architects of the postwar period, in 1958 for the German pavilion at the World Expo. The predecessor of all ceiling floodlights made design history in the following years, was often copied but never equaled. Tecnolumen produced the original in black and white until today. On the occasion of the 110th birthday of Egon Eiermann Tecnolumen presents to two new features - the ES 57 is now additional available in the colours red and green and was - as model ES 57 LED - fitted with advanced, high-performance LED technology. The conventional design of the floor lamp ES 57 has been revised and is now with energy efficient bulbs A ++ to E equipped. This luminaire contains built-in LEDs. The lamps can be replaced by the manufacturer. produces, among other things, the only copyrighted reedition of the wagenfeld table lamp authorized by prof. wilhelm wagenfeld. Do you have a question about "Egon Eiermann LED"? How can we contact you?